Modern and innovative design, high-performance, luminosity and comfort on board the first of the Gran Turismo range. Ideal for demanding sport loving families wishing to discover cruising on a first boat, measuring roughly 30 feet. 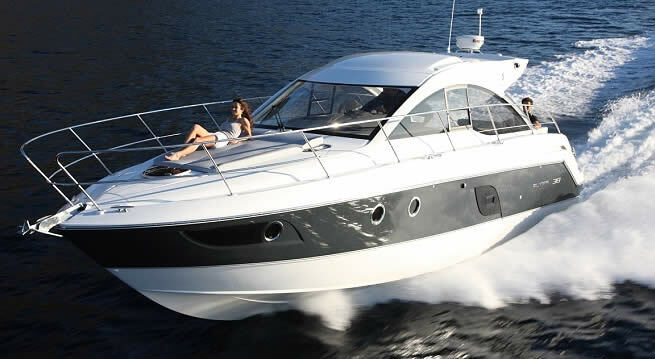 The Gran Turismo 38 is primarily an express cruiser that is fantastic to drive and performs exceptionally well at sea. 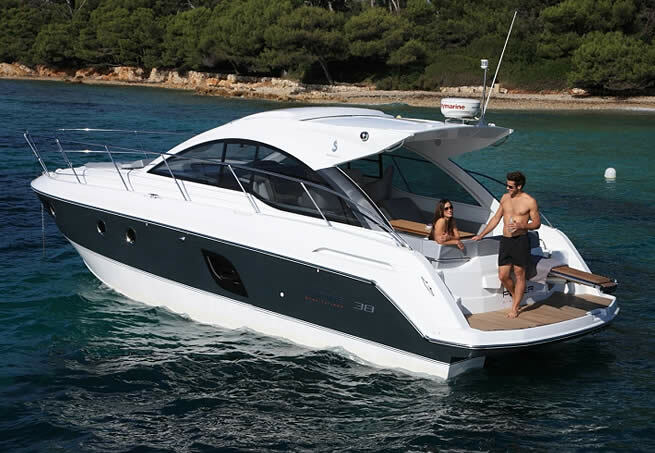 It is designed around the proven BENETEAU-patented AIR STEP hull, which was launched 6 years ago and now features on more than 10 models. It's a design whose performance and benefits have nothing left to prove. The driving position of the FLYER Gran Tursimo 38 is one of the key design points of this boat: sporting style, performance and comfort have all been marvellously achieved in the central position and multiplicity of equipment. space is extraordinarily generous. The Gran Turismo concept draws on the world of Italian lifestyle, with generous living spaces in which details such as new upholstery, new wood finishes, oversize ports and light wells create a feel that is as elegant as it is welcoming. 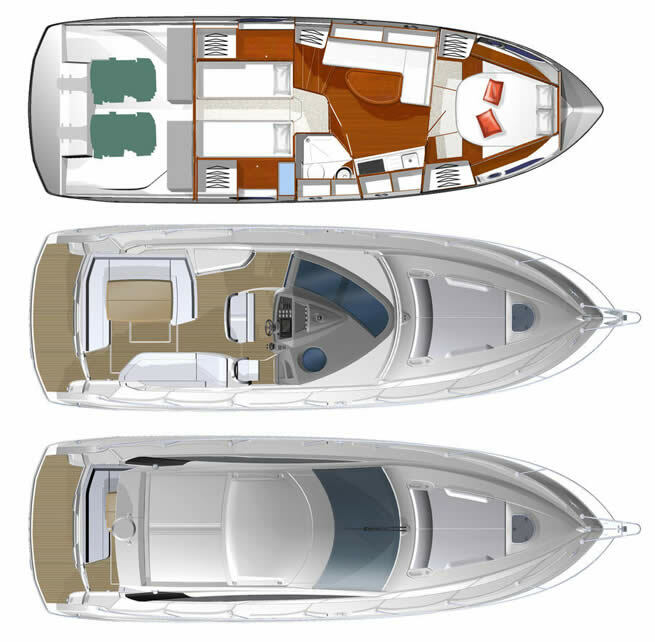 The FLYER Gran Turismo 38 features a spacious cockpit with a lot of stowage space. The aft platform is of generous size, whilst a sunbathing area has been incorporated forward. One eye on the stars, and the other on the sea… The owner’s cabins feature oversize ports to dream the dream! that converts into a double bed. 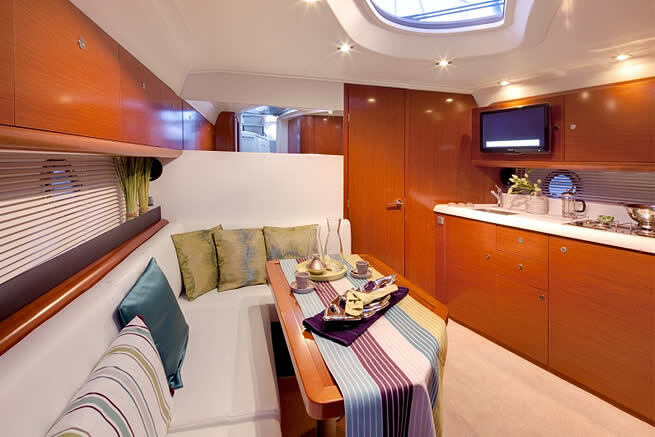 The second cabin to aft also features oversize ports and can accommodate a double bed or two singles.